Samsung i8910HD gets new 1GHz processor? Super fast speeds under the hood - or typo? 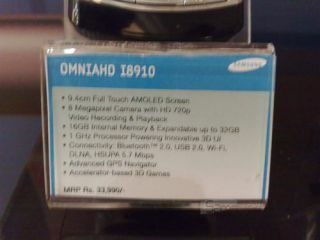 The release of Samsung's multimedia behemoth i8910HD in India has brought a surprise in the shape of an upgraded 1GHz processor. Currently the only phone on the market with such hardware is the Toshiba TG01, but it seems Samsung might be trying out to keep pace with its large-screened phone. The blurry shot shows the specs listed as very similar to that released in the UK (albeit with an upgraded 16GB memory, which TechRadar was told was offered to the UK distributors but wasn't taken up) apart from the faster processor. However, it would seem strange for Samsung to choose this model to carry its fastest ever chip, as it's an aging phone (in relative terms for the Korean firm which seems to announced a new mobile every 7.5 seconds). It wouldn't be the first time a typo on the press specs has led to confusion over a product, and the fact it's called the OmniaHD (which Samsung originally named the i8910HD but then changed) also casts aspersions over the validity of the claim. Still, it would be nice to see on the phone, as it already runs pretty speedily at the moment, so nearly doubling the power from 600MHz to the full 1GHz would see it moved from a good multimedia phone to a great PMP in its own right.